He also said that he had informed Sharad Yadav about his decision to break alliance with Lalu Yadav and seek support from the BJP. 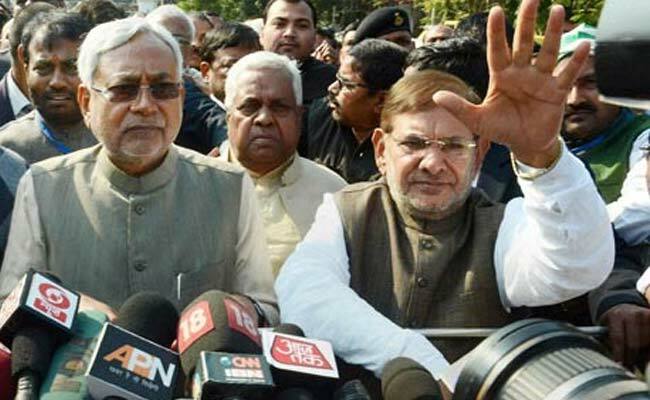 Sharad Yadav said, whatever happened is very unfortunate, referring to Nitish Kumar's alliance with BJP. Nitish Kumar quit alliance with Lalu Yadav, Congress over "corruption"
Sharad Yadav's formal dissent on the political upheaval in Bihar after five long days, drew a prompt response from Nitish Kumar. And the message from the Chief Minister was sharp: Stop sulking and debate in party forum. The forum is the national executive of the Janata Dal United, to be held in Patna on August 19, which will also decide whether the party will join the ruling NDA. Mr Kumar said before taking any decision he always keeps in the mind "what is best for the party". He also said that he had informed Sharad Yadav about his decision to break alliance with Lalu Yadav and seek support from the BJP. Sharad Yadav, 70, who held the post of the party chief for a decade, had stepped aside last year, making way for Mr Kumar. The move was seen as providing the Chief Minister with more legroom to make decisions. But his huge decision last week - dumping the Grand Alliance with Lalu Yadav and the Congress and form a new government in partnership with the BJP - was made without any public bow to the JD(U) veteran. This triggered a huge buzz among the opposition. Leaders like CPI's D Raja said Sharad Yadav was upset with Mr Kumar's decision. Endorsing the view, Lalu Yadav even invited him to lead the battle against the BJP. But there had been no comment from Sharad Yadav, who only posted a series of tweets criticising the Narendra Modi government. Last morning, at Parliament House, Sharad Yadav told reporters, "Whatever happened is very unfortunate, the mandate by the people was not for this". Critics of Sharad Yadav had attributed his silence on the alliance with the BJP to angling for a cabinet berth at the Centre. He is reportedly also eyeing Bihar's Madhepura constituency - where he has won many times in the past - for his son-in-law. Sources say the crack between Nitish Kumar and Sharad Yadav dates back to the latter's backing Jitin Ram Manjhi, who was made the chief minister for a brief spell in 2015, when Nitish Kumar stepped down after the party's poor performance in the Lok Sabha elections. Sunny Deol, Brand New BJP leader, Says "Want PM Modi For Next 5 Years"